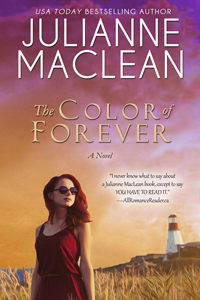 From USA Today bestselling author Julianne MacLean comes the next instalment in her popular Color of Heaven Series, where people are affected by real life magic—and miracles that have the power to change everything they once believed about life and love. Recently divorced television reporter Katelyn Roberts has stopped believing in relationships that last forever, until a near-death experience during a cycling accident changes everything. When she miraculously survives unscathed, a deeply-buried memory leads her to the quaint, seaside town of Cape Elizabeth, Maine. There, on the rugged, windswept coast of the Atlantic, she finds herself caught up in the secrets of a historic inn that somehow calls to her from the past. Is it possible that the key to her true destiny lies beneath all that she knows, as she explores the grand mansion and its property? Or that the great love she’s always dreamed about is hidden in the alcoves of its past?